DIAL: White enamel outer dial with hours and 180 degree indications. Inner rotating dial with minutes indication and angle calculation. Blued steel hands. NOTES: On the 20th May 1927, the 25-year old Charles Lindbergh took off from Roosevelt Airport in New York, in his heavily modified aeroplane, the “Spirit of St. Louis”. He arrived in Le Bourget airport near Paris thirty-three hours and thirty-nine minutes later, securing his place in aviation history with what is accepted as the first non-stop transatlantic flight. Longines was the official timekeeper of the International Aviation Association, having already made its mark as the watchmaker of choice for pilots. While it’s not clear precisely which make of watch Lindbergh clipped to the control panel of the Spirit of St Louis, his own methods enabled him to successfully land in Paris. The achievement cannot be overstated. Equally, it pointed out to Lindbergh that pilots needed something more to improve their calculations. watch to the second was achieved by using a radio time signal without having to adjust the hands, by using the exterior bezel or centre dial, both rotating and both bearing independent minute tracks. Lindbergh, a pupil of Weems, used this as the basis for his own Hour Angle Watch, his own patent registered in 1935. Exploiting both the rotating bezel and the rotating inner dial, Lindbergh cleverly devised and applied graduations, which added a number of functions to the Weems. What he set out to achieve, however useless it was to aviators aside from those flying solo and without the latest instruments or charts, was the rapid equation of solar time. Briefly, the variation between the time we use – the arbitrary 24-hour clock – and that of the sun, can have a difference of some minutes over the course of the year, depending upon the season. The Angle Hour Watch allowed a pilot to make this calculation, avoiding any error that could potentially prove catastrophic. Using Longines Calibre 39.7, with centre seconds in a 47.5 mm or 38 mm case, Lindbergh devised scales to calculate GMT and Universal Time, based on the knowledge that the earth rotates 360 degrees every 24 hours and, therefore, 180 degrees in 12 hours. 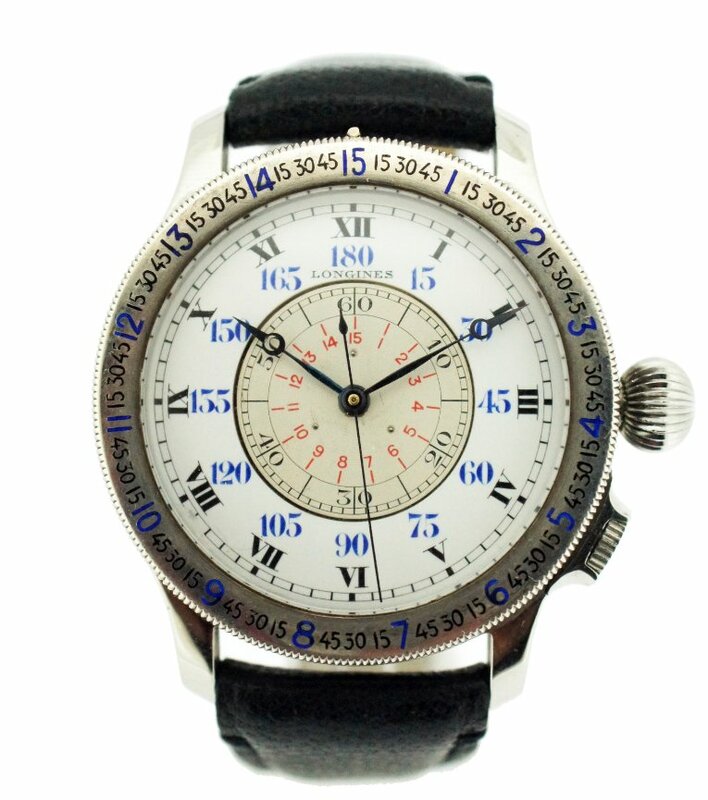 The values in degrees corresponding to each division in time were engraved in the bezel and marked on the dials. The sweep second would therefore indicate minutes from 0-15, the minute hand offered degrees intervals of 15-180. The sum of the values of the three hands would be equal to the Universal Time hour angle of the sun.